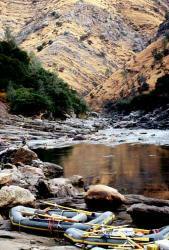 Located 30 minutes east of Yosemite National Park off of California Highway 120, the waters of the Main Tuolumne and Cherry Creek flow through the foothills of the Sierra Nevada. The "T" is another Classic; great rapids, great scenery, and great camping. The river flows the entire spring and summer due to water releases, but watch out for Black Sundays late in the season when they can pull the plug and reduce the flow to a trickle. The Tuolumne has been spared the fate of the South Fork of the American River (i.e., a zillion rafters) by the implementation of a permit system. The first 5 miles down to Clavey Falls is continuous Class III and IV action separated by medium length pools. Most of the rapids are easily boat scouted. It is wise to scout Clavey Falls from the right. You'll know you're there when the Clavey River enters from the right and the river disappears downstream. There are many ways to run the "big drop"; be sure to note the big hole at the bottom. Many a boater has seen the error of his ways and wished to repent, while in that hole. Below Clavey Falls, the river mellows out, and there are long sections of Class I and II between the few good rapids left. The thrill seekers will enjoy riding Steamboat Hole.